My name is Zainuddeen Fahadh; Artist, Designer, and Biz Guy at Ogre Head Studio. We are a two person studio based in Hyderabad, India. 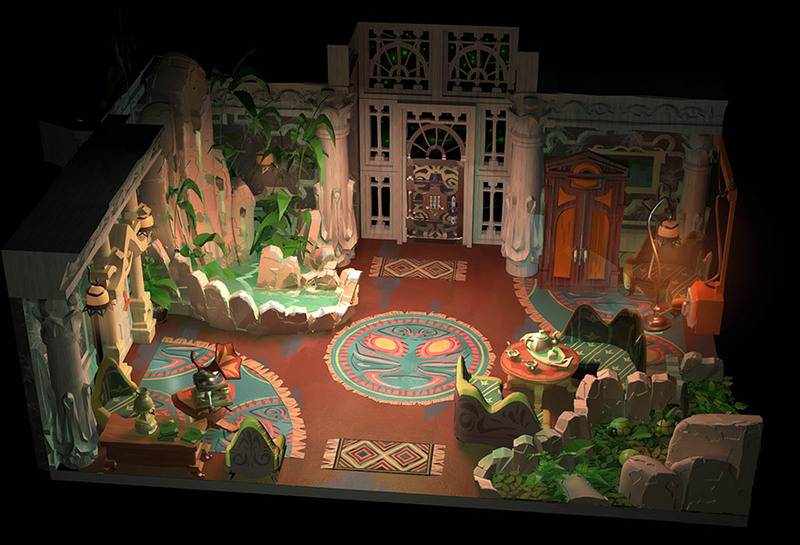 Our goal as a company is to bring a change in the Indian game industry by making amazing games inspired by our culture and mythos. My primary role in Asura is that of a producer, artist, designer and a business guy. My partner, Neeraj Kumar is the tech guy and handles all the programming and technology related roles in our studio. The action RPG genre has, for the most part, relied on stat based combat system wherein you spam your abilities to slay the enemies. 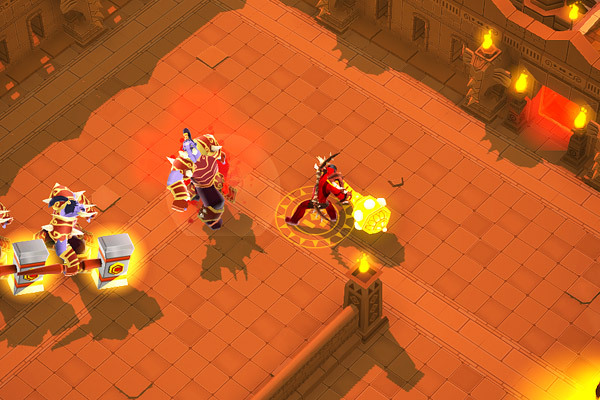 However, in Asura, the combat system is different. Asura has a Telegraph based combat system. 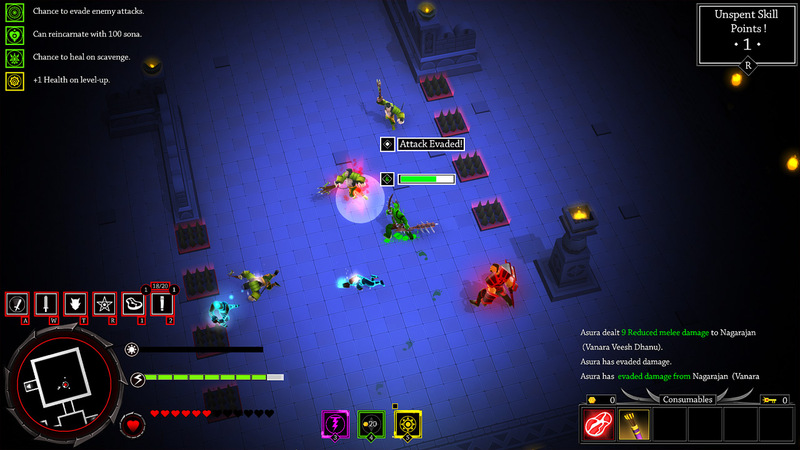 The player has to make sure that he evades enemy attacks while making sure that he utilizes his resources and stats optimally. Failing to do so will result in a gruesome death. Oh, and by the way, death is permanent in Asura! 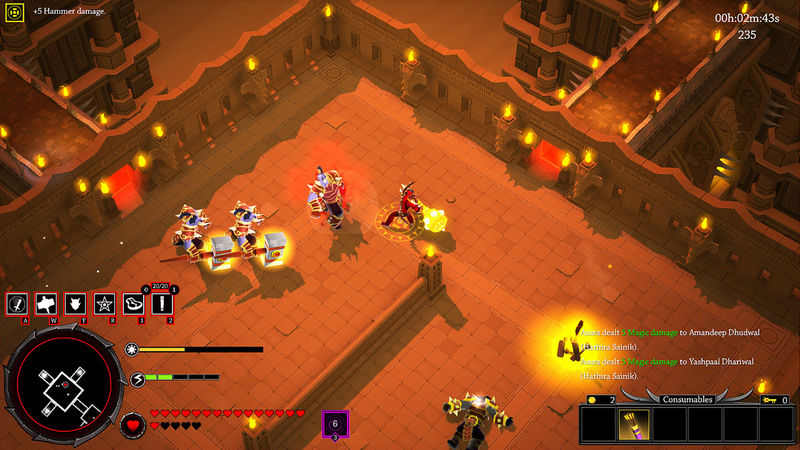 Asura is a rogue-lite wherein when you die, you restart the game from the very beginning. If we had adopted an ARPG (action roleplaying game) combat system, the game would have turned out to be repetitive. You spam your abilities, make sure your stats are up, and your gears are right in an ARPG combat system. This would hamper the gameplay experience in Asura. 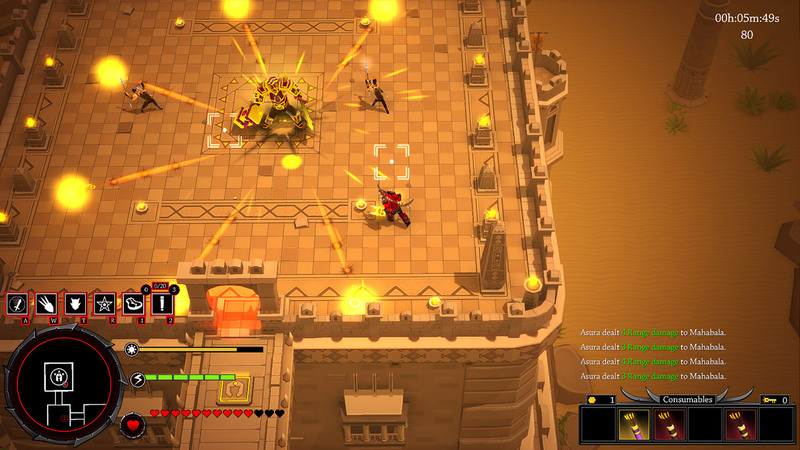 We were aiming for high replayability, and the telegraph based combat system in Asura, which is difficult, is quite rewarding once you get good at it. Hence, we adopted the Telegraph based combat system over the other methods out there. Asura has a melee and ranged attack at his disposal. We tried to make this mechanic interesting by introducing the enemy armor system. The melee enemies will take full damage from your ranged attacks, and ranged enemies will receive maximum damage from your melee. 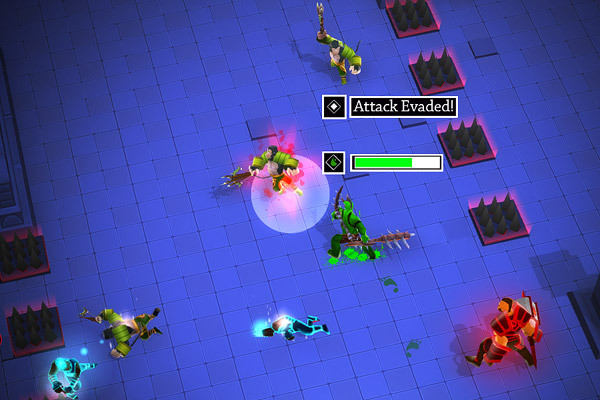 This makes sure that the combat system is always dynamic and the player is analyzing while in battle. Coupled with the weapon stamina, arrow count, and other mechanics, the combat system feels fresh and unique in Asura which helps with the replayability. During the prototype stage of Asura, we had tried the combat system more akin to popular ARPGs out in the market like Diablo, Path of Exile, etc. We felt that it got repetitive very soon. We needed to make sure that it was a bit complicated and spamming to slay your enemies would not get you very far. Hence, we introduced mechanics like weapon stamina, dodge roll, arrow limit in our combat system to make the gameplay exciting and one with a lot of depth. 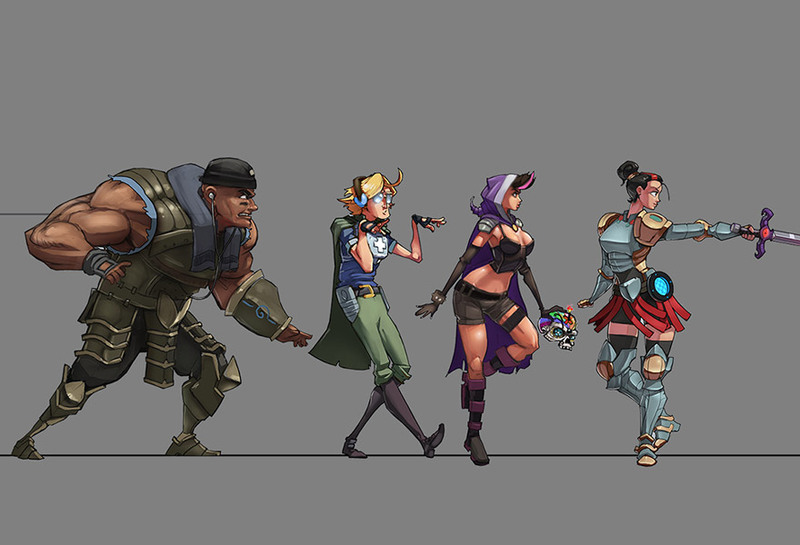 One of the challenging elements to get the combat system right was the overall character/enemy stats. 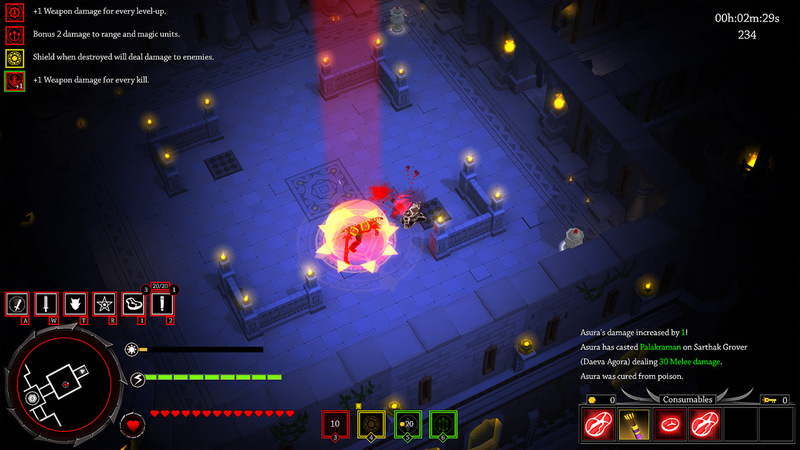 Asura has procedurally generated levels along with a skill tree which also procedurally generates. We have to make sure that when there are so many systems relying on procedural generation, that it does not hamper the game balance. Hundreds of hours of play-testing and tweaking the numbers on enemies and Asura stats made sure that the combat system is optimal. It is fair to say that the gameplay in Asura can get imbalanced during some runs because of the RNG (random number generator) not working in your favor but that is a part of the rogue-lite genre in our opinion! There are approximately 80 skills in the game which randomly get a slot in the 4 main branches of the skill tree. In a run, Asura can attain a max level of 10 and can only select 10 of the 16 skills in the tree. In Asura, the skill tree is procedurally generated which means that it changes every time you play the game. The skill tree is divided into four main branches namely Yodha / Warrior Shastra which provides damage skills, Chalak / Cunning Shastra which provides agility and rogue skills, Bal / Might Shastra which increases your health and Mantra / Magic Shastra which contains various active and passive magic spells at your disposal. We thought that these four main branches compensated Asura’s abilities as a demon. Also, Asura was created by the four Rakshasa or Demon Lords each representing the Shastra in the skill tree. All these factors led to Asura having four types of skills. There have been many ways through which we have got the idea for the abundant skills in Asura. Sometimes, I would sketch a basic idea of what and how a particular skill would work and then share it with Neeraj. He then will implement it and we will proceed to playtest it for a while. If it sticks, then the skill will go through the final polish process and is then added to the game permanently. We playtest Asura a lot, and when we reckon that there is this amazing ability that Asura could perform in the game, we try to add it as a skill. Some skills have been inspired by other games like Diablo, Binding of Isaac, etc. When we were prototyping the skills, we had five different skill type/branches in the game. 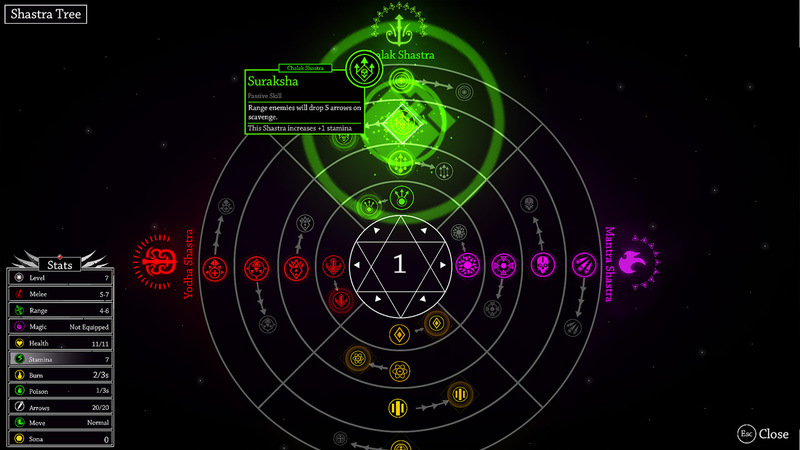 Eventually, we realized that it was hard to manage and pick from a skill tree with so many types. As Asura is a rogue-lite and the players will die a lot and respawn from the very beginning, we were aiming for a skill tree which would be fun and exciting even if you could only make it up to character level two. Hence, we had to finally limit ourselves to the four main branches of skills in the tree. Another limitation we had was that we could not have skills which were basic passives such as the melee damage increase and range damage increase, which is usually found in other RPGs out there. We had to make sure that each skill was unique and felt great when using them. This also helped us a lot in achieving our goal of making a skill tree which is randomly generated. 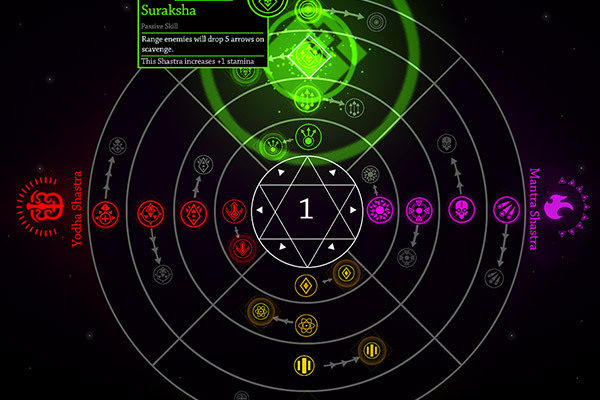 One of our design goals for Asura was that we wanted to make a game with a procedural skill tree. 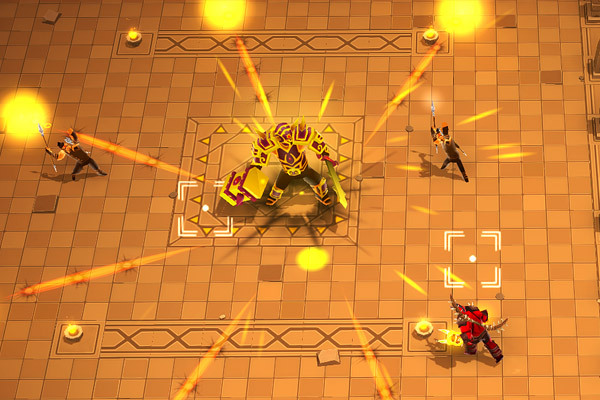 Asura is a rogue-lite game wherein the player will die and lose all their progress. We thought that if the skill tree is generic then you won’t have a unique experience every time you play the game. 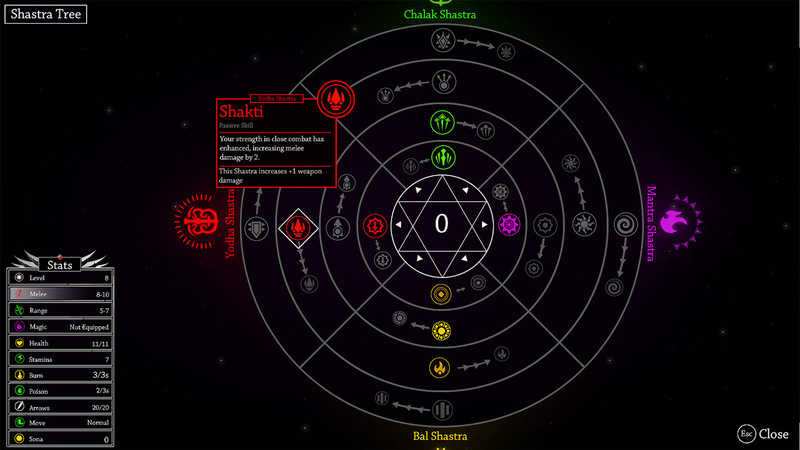 Also, a procedural skill tree has never been used in any other game so the excitement of trying to develop and innovate in the genre was one of the main reasons why the skill tree shuffles in Asura. We had to make sure each skill was unique and did not have similar characteristics or effects. 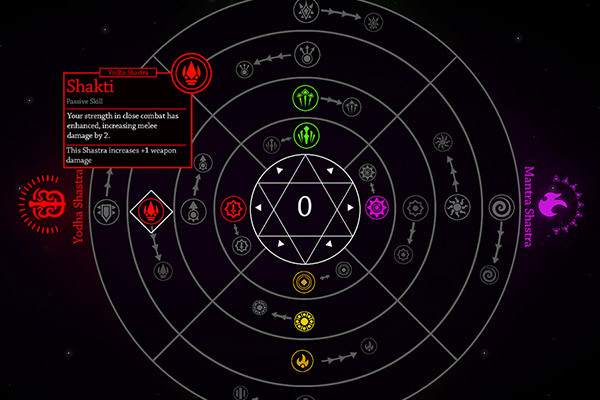 This was to amplify the effect of the procedural skill tree and to keep the game fresh every time you play it. I would like to assume that we have a done a good job with the combat system in Asura. However, the skill design and the skill tree is what we are proud of. It was one of the primary design goals as we started the project and we are pleased with the tree and how it shuffles every time you play the game. I would like to believe that we are the first one to introduce the procedural skill tree in a game. It is super gratifying to see everyone appreciating the skill tree once the game was released! You must have a favorite skill? My favorite skill is Palakraman, which means focus in Hindi/Sanskrit. 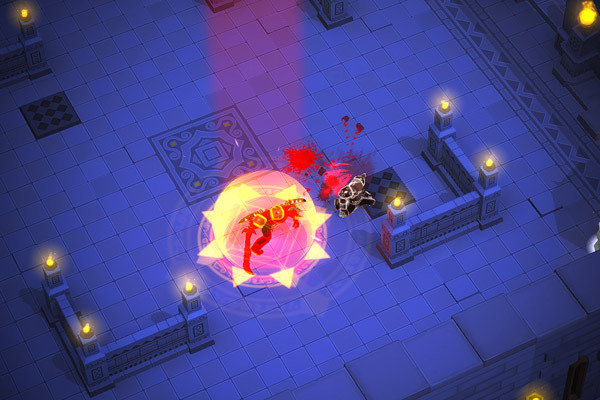 It is an action which enables Asura to blink close to an enemy and deal a critical (double damage). I love how we executed the design for this skill and the effects are also EPIC! The rise of the independent game development scene is the reason why a small but passionate team like ours can develop games and make a living out of it. It has helped us share our passion, culture, and mythos to the world and the gratification that we receive when our audience plays and enjoys our game is priceless. I think the independent games, the developers, and the entire gaming community are what excites us most with regards to the current game development scene. We thank Zainuddin Fahad for talking about the development process on the combat and skill design in Asura.